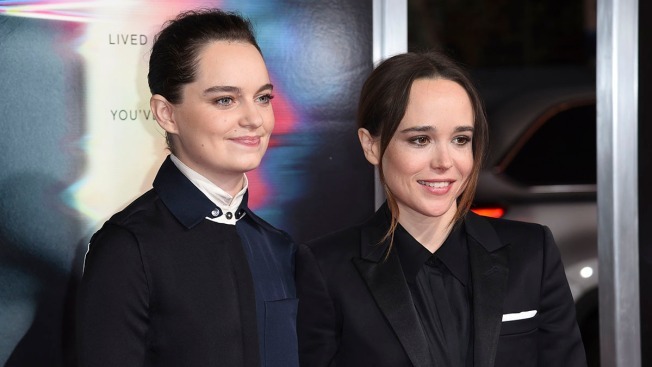 FILE - Emma Portner, left, and Ellen Page arrive at the world premiere of "Flatliners" at The Theatre at Ace Hotel, Sept. 27, 2017, in Los Angeles. Ellen Page is now a married woman. The 30-year-old star of "Juno," ''Inception" and the recent remake of "Flatliners" wed Emma Portner, who teaches contemporary jazz at the Broadway Dance Center in New York. Page first posted the news Wednesday on Instagram in a photo of the couple's hands showing off wedding bands on their ring fingers. Her publicist later confirmed the union. In addition to teaching dance, Portner has choreographed for Justin Bieber.